My great-great-grandfather Moritz Kupfer, along with his nephew Aloys Kupfer and Hermann Glaser, another relative through marriage, sowed the seeds of a sheet and mirror glassmaking dynasty in the mid-1800s. Their business activities were concentrated in the Oberpfalz, in northeast Bavaria, and in Bohemia, which was then part of the Austro-Hungarian Empire. They later expanded to other parts of Bavaria as well as to the Salzburg area of Austria and to Galicia, a region straddling the modern-day border between Poland and Ukraine. At the peak of their success, around the turn of the 20th century, the Kupfers and Glasers were one of the largest producers of sheet and mirror glass in the region. Through several partnerships, the family controlled a dozen glashütten, or glass foundries, and 40 to 45 schleif und polierwerke, grinding and polishing works. The sprawling enterprise employed 900 to 1,000 workers, in addition to dozens of others involved in management and sales. To what extent that respect extended beyond the sphere of business is hard to say. 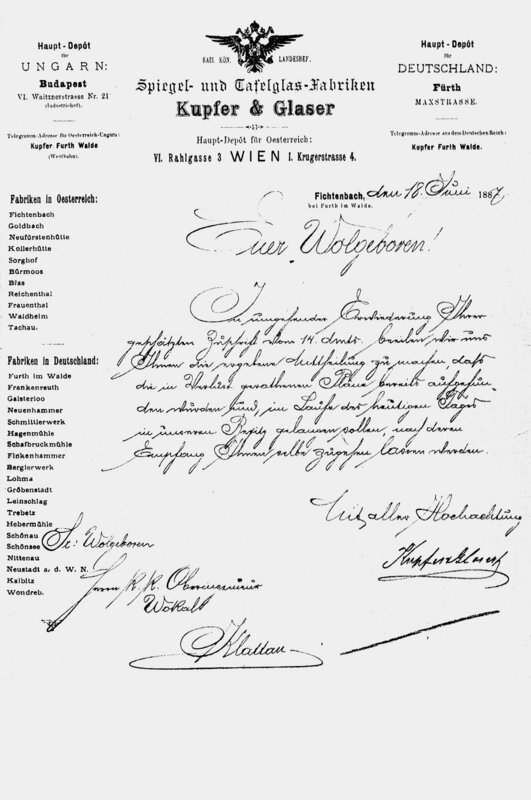 However, one sign of the family’s social stature appeared toward the end of the 19th century when Moritz’s son, Eduard, was appointed a kommerzienrat, or commercial counselor, an honorary title bestowed by the Bavarian government on distinguished businessmen who have made significant contributions to society. The Kupfers apparently got their start in glassmaking by way of potash, an alkaline compound derived from tree ash that was an essential raw material in glass production in northern Europe. The family had most likely been potash traders, a not uncommon occupation for Jews, before branching out into manufacturing. The Kupfer operations, like other glassworks in the region, were initially located in remote forest areas to satisfy the industry’s huge appetite for timber. Indeed, glass produced by these foundries was sometimes called “forest glass,” characterized by a greenish-yellow cast. In the second half of the 19th century, however, as coal began to replace wood as fuel for the foundries, glass production began to shift to more urban areas with better transportation. This was particularly true in the Oberpfalz, which had no coal mines of its own and had to import the fuel by rail. The Kupfer business was truly a family affair. As with many other German Jewish families, personal and professional relationships were often cemented through marriage and business partnerships. In a society where Jews were often excluded, these relationships provided access to financing and, equally important, a means of sharing responsibility and risk within a framework of mutual trust. At times the intertwining of family members was almost incestuous. To cite just a few examples: My great-grandfather Eduard Kupfer married Franziska (Fanny) Glaser, the daughter of Hermann Glaser. Eduard’s first cousin Aloys Kupfer married two of Eduard’s sisters in succession, first Johanna and then, after Johanna died at age 30, Josephine. Hermann Glaser’s son Sigmund married Aloys' sister Marie, and another son, Ignaz, married Aloys' daughter Emilie. And so on. Dozens of Kupfers and Glasers were involved in the family glass business through the generations, including four of Aloys’ five sons, four of Eduard’s five sons (my grandfather Otto among them), and two of Hermann Glaser’s five sons. The family’s far-flung operations were all managed by family members or trusted associates. Image top: Weiden glashütte, early 1900s.